Humans have built all sorts of buildings across the world and it was only a matter of time before we started thinking bigger, outer-space to be exact. Recently, NASA has revealed its plans to explore in-space manufacturing using 3D printing. In 2014, the International Space Station’s 3D printer created the first 3D printed object in outer space. This was a big step in confirming the future of 3D printing capabilities as far as in-space printing was concerned. Using a process called additive manufacturing, the 3D printer was able to make replacement parts for itself by heating a plastic filament and creating a layer at a time, eventually building the entire part. This 3D printing process was done in zero-gravity and was aimed to show how additive manufacturing has the capability to create a variety of 3D printed tools and other parts in space. Fast forward from 2014 when the first in-space 3D printed object was created in February 2017, when astronauts successfully built a 3D printed sculpture of the human laugh, part of a project called #Laugh. The first sculpture to ever be produced outside Earth, it is the creation of Israeli artist, Eyal Gever, who has collaborated with Made In Space, a company which operates the Additive Manufacturing Facility (AMF), the commercial 3D printing arm of the International Space Station. The sculpture is a representation of a human laugh made using sound waves that have been converted into a 3D model, also known as a ‘laugh star.’ The Additive Manufacturing Facility was brought to the International Space Station in April 2016 and after the 2014 model, is only the second such printer to arrive at the ISS. Sculptures aren’t all that 3D printers can create. The United States is now home to the world’s first 3D printed houses. American and Russian construction companies are teaming up to use a 3D concrete printer, which claims to be able to help build a house in just one day! The houses will be built using a Russian 3D printed called Apis Cor, which only uses eight kilowatts of energy and construct houses using additive manufacturing, and produces miniscule amounts of waste. This process has immense potential in the construction industry, where currently, construction of roads, for example, depends on equipment such as the universal milling machine, which are monitored by a technician. The houses are built using minimal energy and the machine itself is portable, which means it can be taken to and from different construction sites. The company aims to build 100 affordable homes across a 21-acre ‘eco-village’ with the future aim of teaching people about sustainability and helping to eradicate poverty across the world. These machines are lightweight, which makes them conducive for use in outer-space manufacturing as well. However, only time will tell if this revolutionary construction method will be widely adopted or not. In-space manufacturing is even being used to build fibre-optic cables, a process which is difficult to complete on Earth. Thorlabs, an American company, has been working on improving the quality of a special heavy-metal glass fiber called ZBLAN for over ten years. This type of fiber optic cable will provide lower transmission losses than the silicon dioxide used in traditional cables. However, manufacturing ZBLAN on Earth poses a problem due to gravity, which causes structural imperfections. With an ever-growing demand for data, the global population can benefit from better-quality fiber optic cables printed in-space using 3D printers. Made in Space (MIS) plans on creating these fiber optic cables in zero-gravity conditions aboard the International Space Station (ISS). MIS and Thorlabs hope to have a prototype by the end of 2017. Building on the idea of using 3D printers to create tools and sculptures, in February 2017 NASA revealed plans to use additive manufacturing to enable in-space manufacturing on Mars in the near future. 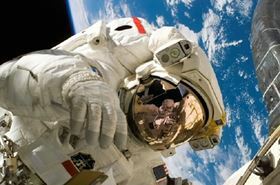 During the Additive Manufacturing for Aerospace, Defence and Space conference held in London, Dr. Raymond Clinton said NASA plans to use 3D printing to enable in-space manufacturing (ISM). In recent times, NASA has been exploring the possibility of 3D printing on Mars using bedrock material from the planet itself. Scientists believe the metals in the materials found on Mars may be able to be 3D printed. Extracting metals from Martian soil is called ‘molten regolith electrolysis’ and involves extracting regolith, which is also known as moon dust. This material is in short supply on planet Earth and despite simulants existing, they are not of the exact same composition as the soil found on Mars. The metal extraction process is similar to the one used on Earth and involves astronauts placing Martian soil into a highly-heated chamber (1648 degree Celsius or 3000 degrees Fahrenheit). The process results in oxygen and molten metal, with the metal being used in a 3D printer for construction purposes. In-space manufacturing is a topic that NASA has been researching since 1999, but couldn’t continue due to the lack of funding. This changed a few years ago, when research was reopened and NASA continued to find ways to explore space in new ways. In-space manufacturing is a necessity for continued space exploration in the right direction. Apart from NASA, the United Arab Emirates has also revealed Mars 2117, a project which aims to build a colony on the red planet. Elon Musk also has plans to develop a million-strong colony of humans on Mars in the coming years. All of this will require construction and this is where 3D printers, which can function as in-space manufacturing units, will be invaluable tools. The biggest challenge facing in-space manufacturing is inspiring confidence in the products that are being built. In order to develop confidence in the final product, everyone from designers to astronauts must be educated. Further, it is only when our future generations are educated to have a better understanding of 3D printing technology and its vast potential, will the technology be accepted. This story is reprinted from material from Rachel Oliver with editorial changes made by Materials Today. The views expressed in this article do not necessarily represent those of Elsevier. COSM Advanced Manufacturing Systems LLC has been selected to design an electron beam 3D printing system for an in-space autonomous assembly program. Hexcel Corp and Oxford Performance Materials have formed a partnership.